Are you tired of spending time and energy to cut firewood for home uses? If so, there is no worry for such things anymore. Using electric log splitters, you could save the operating hours of labor in splitting firewood for home needs and so far your energy. A log splitter is a machine used to cut firewood into smaller pieces. 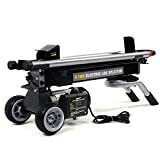 Our article is going to highlight the 10 Best Electric Log Splitters Reviews. Without further ado, let’s look into these beasts. It’s no longer a problem when it comes to cutting piles of wood into firewood. With WEN 6-ton Electric log splitter, you could turn woods into useful firewood really quickly and efficiently. This one can allow you to split logs with the size of up to 10 inches in diameter and 20.5 inches in length. This wood splitter is quiet to operate, safer and more productive than most splitters on the market. The next one is Boss Industrial Electric Log Splitter. Designed with powerful 2HP electric motor, its capacity is up to 7 tons of splitting ability. This log splitter is also easy to use with the just one-handed operation, and it is also designed with automatic ram return when you take your hand-off of the machine. Boss Industrial also gives a 2-year warranty on this log splitter to customers. This is definitely one of the best log splitters for large logging projects. With this Goplus Electronic Hydraulic Log Splitter, you could always cut the wood perfectly for any home with wood-burning stove or fireplace. The motor power is 1500W. 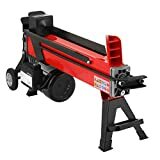 Its capacity has the maximum splitting force to 6 tons and is able to split the logs of up to 20.4 inches long and 1.9-9.8 inches in diameter. This log splitter’s design is also designed for easy transportation and provides you an easy way to deal with the wood. With all these features, stop being hesitating and get one for your home. This one is a hydraulic and portable electric log splitter. This electric log splitter is really powerful. It allows you to cut more than 100 logs within less than 60 minutes and won’t cause you a backache, fatigue or a headache. The splitter is also designed with motor power 2500W that could cut logs up to 7 tons force and won’t be running out of gas in the middle of the operation. Two-handed operation is also included in order to ensure the best safety features for customers. This log-cutting machine is easy to use, lightweight, and compact. It has 7” wheels for convenient transportation. This logging cutter is sturdy and powerful as it is made from sturdy steel and 2HP electric motor, which could split the logs up to 7 tons. In addition to the reasonable price tag, this log splitter sure works well and is quiet to operate. This Southland Outdoor Electric Log Splitter could cut the most challenging types of wood. It features a powerful 1.75 HP and heavy duty 5” steel wedge that can cut the logs quickly and easily. This log splitter is also very easy to operate and basically easy to assemble by just putting the wheels on. The splitter is also safe and more productive when it comes to logging tasks. With an effortless ability in splitting the big wood, this one needs only an 18-second cycle time. This one is stronger, simpler, and faster to operate your work. This K10 log splitter works 15 times faster than any electric hydraulic splitter. The K10 can split log 16 inches long and up to 12 inches in diameter. It takes one 1-second cycle time for its ram to cut the log and return. With the unit’s electric operation and compact design, the K10 log splitter is safe for both outdoor and indoor use, easy to maintain and store. The product also has a 2-year warranty that you can benefit from. 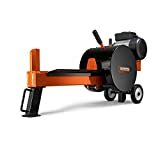 With a 2HP motor, this one works perfectly with a 6-ton splitting force that could cut logs of up to 20 or 22 inches in length and 10 inches in diameter. It is also operated under two comfy grip handles in order to avoid anybody injury. This electric log splitter also has 6” tires, providing an easy way to move the machinery around the house as you wish. This one is a great choice if you are looking for a splitter to do small to medium scale tasks. The splitter’s capacity could chop logs up to logs of 21” in length and 10” in diameter. The splitting force is up to 6 tons, and it takes only 22 seconds for its cycle time. It weighs 101 pounds and has the total dimension of 19 x 12 x 42 inches. The very best and last item on our list is the Boss Industrial ED8T20 Log Splitter. This one is perfect for multiple log chopping applications. With 8 tons of force and 2HP motor power, this is one of the best electric log splitters made to deal with some of the strongest wood. The splitter comes in dark red color and a total dimension of 20 x 13.5 x 52 inches. The splitter could chop logs up to 20” in length and 10.5” in diameter. The machine weighs 160 pounds and is able to split two logs per one cycle. 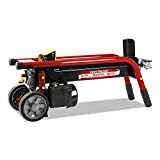 With this list of the best electric log splitters reviews provided, you should be able to find the ideal log splitter that can save you energy and time on log splitting. Stops hesitating; it’s always too smart choice to invest in these machines to save your money in a long run.